A substantial search of the accounting theory literature and contemporary developments on global accounting regulation requires to successfully undertake this. According to Lewicka-Stralecka (2010) the sustainable development of the business is the process of identifying the environmental and the social factors that will affect the business process in the long term. In the recent years, it is seen that a business needs to maintain the financial resources as well as he nonfinancial resources like the environmental factors which will affect the business function and the effect of those factors on the society as a whole. According to Theresa (2010) sustainability may be defined as the capacity to survive or endure the current situations and atmosphere. Without the sustainable power the business or the individual won’t be able to see the future. For the business organizations attainting a degree of sustainability is essential for them to achieve the future growth. To sustainability to the changing situations the society as a whole should try to change the different factors with the changing time. Waldman et al. (2009) opined that corporate sustainability refers to the effective management of different environmental, social and financial factors to ensure that the business is conducting its activities in an ethical manner. 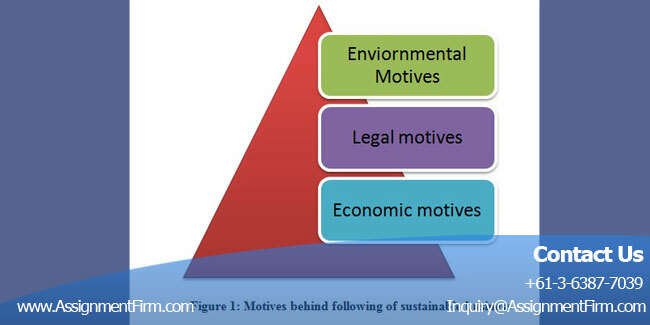 Environmental motives: the organizations are responsible for mot only creation of profit but also serve the society. If the atmosphere of the society is harmed by the services of the organization then the profits earned by the organization will be of no benefit. Hence too keep the business environment friendly the organizations nowadays implement various strategies to make the business sustainable. The initiatives among tem include the conservation of energy, resources, reduction of pollution and waste from the production of the business (Berenbeim, 2010). Economic motives: these motives are the main motives of the business. The organizations need to maintain a sustainable environment so as to keep on earning profit for the rest of the years in a consistent way (www.iiaustralia.org, 2014). Generating of consistent revenue and reduction of the costs of production are the factors which induces the organizations to be sustainable in their approach. Legal motives: a business in order to operate smoothly in a country needs to abide by the legal rules of that given country. And the legal rules are made keeping in mind the welfare of the society as a whole. According to Benedict and Elliot (2011) the rules of a given country are formulated in accordance with the environmental actors that would affect the people of the country. In this respect it can be stated that the rules include the following of various resource conservation acts, water and clean air conservation acts etc. the business in order to facilitate the smooth working of the business environment should abide by these laws (www.iasplus.com, 2014). The organisations nowadays are facing the problems of being sustainable and are also facing an increased pressure from the sides of both the government and the customers to be environment-friendly and be sustainable in their approach. According to Cheney and Roper, 2010) the organisations by being sustainable will be able to provide the customers with innovative products and services. The organisations will be able to contribute to the preservation of the energy and other scarce resources. Elmaleh (2009) are of the opinion that the business by being sustainable will be able to produce products which are healthier compared to other products. And this will help the business to gain a competitive advantage over the other business. Nowadays consumers have become more conscious about the type of product they are using and hence a business by being sustainable will be able to get an added advantage. According to Werther (2010) is the combined presentation of the financial as well as other relevant information of the business. It shows the organizations strategies, its governance and also its economic and social factors. It is seen that generally stakeholders of the company are not only interested in the financial information of the company but also in the other relevant information hence the integrated reporting (IR) is made to provide them with all the required information. Eccles and Saltzman (2011) opined that the IR enables the external parties like the shareholders and the stake holders to understand how the business creates value and how it operates. This report deals with the factors like the environmental factor, globalization, corporate transparency and resource scarcity. Strategic focus: this report showcases the organization’s objectives and the relation of these objectives in creation and sustenance of the business value, resources and the relationships of the business with the other external parties (Lewicka-Stralecka, 2010). Connection of the information: the report shows the connection between the different factors present within the business like the connection between the business model and the external factors (Borzaga and Becchetti, 2010). Relation with the stakeholders: this report provides insight knowledge about the relation of the business along with its stakeholders. It also highlights the ways in which the business tries to understand the needs of the stakeholders and provides the solutions accordingly. Concise information: the report deals with providing the concise and reliable information in all respects. It provides only the information that is required by the company to create value in the business. Governance of the organization: the report provides information about the governance structure of the company. It explains the leadership style and the decision making process. Performance of the business: the report deals with facts that are present in the organization which influences the overall performance of the organization. The fact thus provided by the report is of importance to the external parties. According to McGaw (2010) the impact of the corporate behaviour on the stakeholders of the company are of real importance. It can be said that the activities of the company are monitored by the external stakeholders since the activities of the organisation will affect the stakeholders at both personal as well as financial level. A high sustainable firm pays attention to the well maintenance of the relation between the stakeholders like the cordial relations between the employees and the different levels of management, the customers and also the non profit organisations who monitor the functions of the business and decides whether the same is environment friendly or not. Jones (2010) have argued that the low-sustainability firms, on the other hand, will not maintain any reporting system and will only follow the traditional method of producing the financial data about the company. This will not help the company though build a sustainable relation with its stakeholders and hence the business will not be benefited in the long run. According to Aras and Crowther (2012) the financial crisis which is faced by the companies in the long run can be reduced by incorporating of the effective financial Accounting Theory model. The existing model has a lot of disadvantages in respect of providing the information. The financial models which are used by the companies only provide the financial data without any consideration on the non-financial and marketing facts. Bendixen and Abratt (2011) have stated that the financial reportings a historic reporting tool which considers the past data of the business and it doesn’t include any future plans of the business. The financial reporting focuses on the numbers of the business mostly and in his respect, it can be said that the report lacks the qualitative information. Van Marrewijk (2011) argued that this representation of the quantitative data alone is not sufficient as the stakeholders nowadays are interested n the reporting of qualitative data more like the strategy of the business, the vision and the mission of the business and also the sustainability issues of the business. 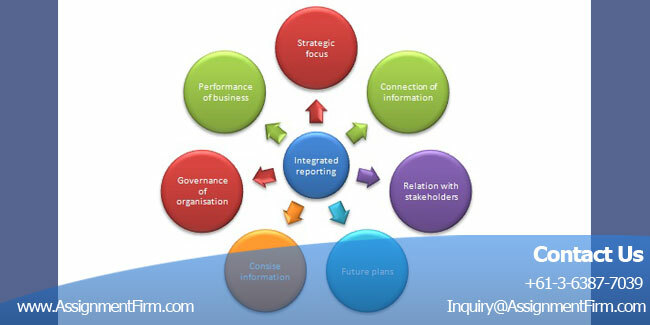 According to Roome and Bergin (2010) Integrated reporting aims at providing the information about all the aspects of the business. The aspects include the strategies, missions, visions and also the financial data about the business hence this report helps the stakeholders to analyse the actual position of the business. Hence it will provide a better framework for the organisations than the traditional Accounting Theory reports which are used. Since the company is dealing with the minerals and the resources hence this report will provide useful knowledge to the NGOs and the investors about the smooth operations of the company. Tebo (2011) are of the opinion that business will get a sound knowledge about the allocation of the capital because the providers of the capital will be able to get quality information about business and will accordingly provide the capital required. The integrated report also helps to identify and communicate all the financial and non-financial factors that will add to the value of the business in the long run. This will particularly benefit the shareholders and the customers because the long-term objectives of the business if clearly defined will help the shareholders to take the investment decision and will help the customers to purchase the product of business (http://leadinglightleadership.com, 2014). The companies who have resorted to the integrated reporting process has encountered several advantages in his respect which may be enhancing the internal coordination among the different employees and other internal parties, effective internal and external communications, providing of concise information which will help the stakeholders to easily understand the business information. In his respect, it may be stated that it becomes difficult for the consumers, suppliers and the shareholders to interpret the Accounting Theory numbers and understand the business position. Hence this report will also provide the qualitative content and will help the less knowledgeable persons to understand better (www.theiirc.org, 2014).